uuid : 00c8fc55-2676-451d-8292-049ebd23732c templates_id: 119563 templates_uuid: "f65dee19-6f42-4dfb-970d-240e4bd66695" title: "Suspension Letter Pending Investigation - Letter suspending an employee" display_name: "Suspension letter" meta_keywords: "Letter suspending an employee" description: "
Make sure you do things right when you discipline an employee, with this employee suspension letter pending a disciplinary investigation. The suspension letter sets out in clear and simple terms the process to be followed and the employee\'s rights, helping ensure that the employer complies with the laws on unfair dismissal. It covers notification of the suspension, arrangements during the suspension and request for potential witnesses and/or information relevant to the investigation. What is a suspension letter? A suspension letter is a letter that temporarily prohibits an employee from performing work pending a disciplinary investigation. It formally notifies the employee that they cannot attend work during the period specified in the letter, and outlines their rights and obligations during such period. Why do I need a suspension letter? Suspending an employee may be necessary when dealing with a serious disciplinary allegation, in particular in the event of investigation for gross misconduct. 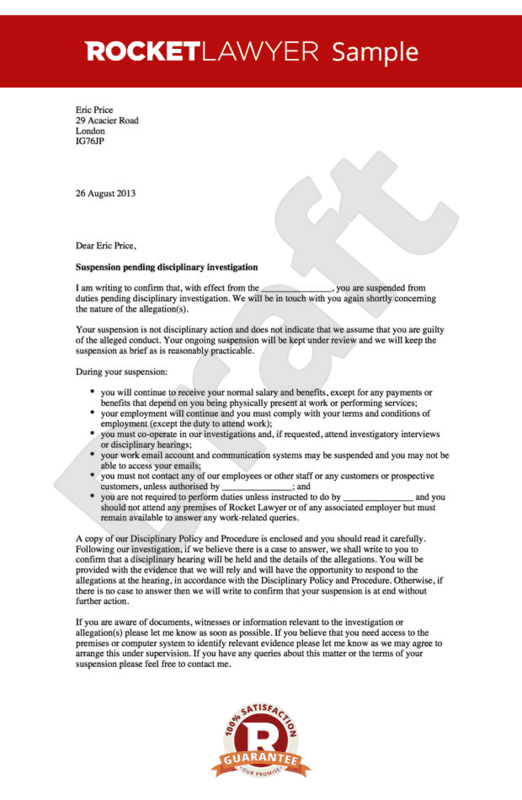 A suspension letter keeps the employee away from work while you investigate and helps you protect the business, people and evidence during the investigation process. It also gives you time to figure out what the next appropriate action should be. What process must be followed before issuing a suspension letter? Make sure this suspension letter is part of a clear and fair disciplinary procedure. When does the suspension period take effect? The letter must specify the date where the suspension period takes effect. The suspension cannot take effect before the employee knows about it so if you are posting the letter then the earliest that it can be effective is the date that the employee receives the letter. How long should the suspension period be? The length of suspension should be determined based on the expected length of investigation, and must remain as brief as possible. If the employee is accused of gross misconduct, the suspension period should be no more than five days. What are the employee\302\222s obligations on receipt of this letter? What are the employee\302\222s rights during the suspension period? The suspension letter should make clear that suspension does not mean that the person will necessarily be dismissed. During the suspension, the employee continues to receive their normal salary and benefits, except from any payment that depend on them being physically present at work. Can the employee access the premises during the suspension period? The suspension letter usually prohibits the suspended staff from accessing the premises, in order to facilitate the investigation process and protect evidence.
" created_timestamp: "2018-10-08 04:36:58.0" modified_timestamp: "2018-10-08 04:36:58.0" active: true created_by: 236 modified_by: 236 dcm_id: 235 url_slug: "Letter-suspending-an-employee-pending-a-disciplinary-investigation" meta_description: "Create a work suspension letter pending a disciplinary investigation with step-by-step guidance from Rocket Lawyer. Make sure you do things right when you discipline an employee with help from expert solicitors when you need it. " time_to_complete: "10 minutes" role1: "Employer" role2: "Employee"
Make sure you do things right when you discipline an employee, with this employee suspension letter pending a disciplinary investigation. The suspension letter sets out in clear and simple terms the process to be followed and the employee's rights, helping ensure that the employer complies with the laws on unfair dismissal. It covers notification of the suspension, arrangements during the suspension and request for potential witnesses and/or information relevant to the investigation. What are the employees obligations on receipt of this letter? What are the employees rights during the suspension period? More than just a Suspension letter template, our step-by-step interview and guidance makes it easy to create your document. Easily create online, download, print and sign your free Suspension letter in minutes. This document is also sometimes called: Letter suspending an employee.